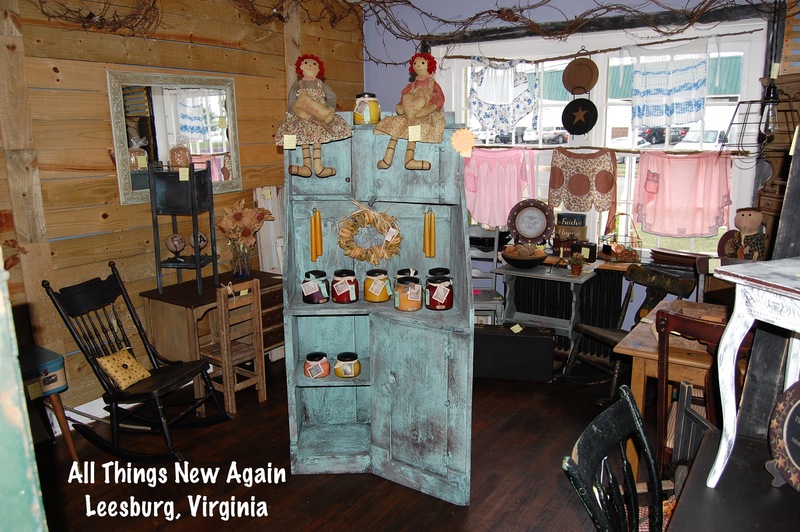 Here’s a look at another one of the projects we have been working on to make our All Things New Again shop, well, new again. Are you still going to carry “primitive” style items in the new shop? 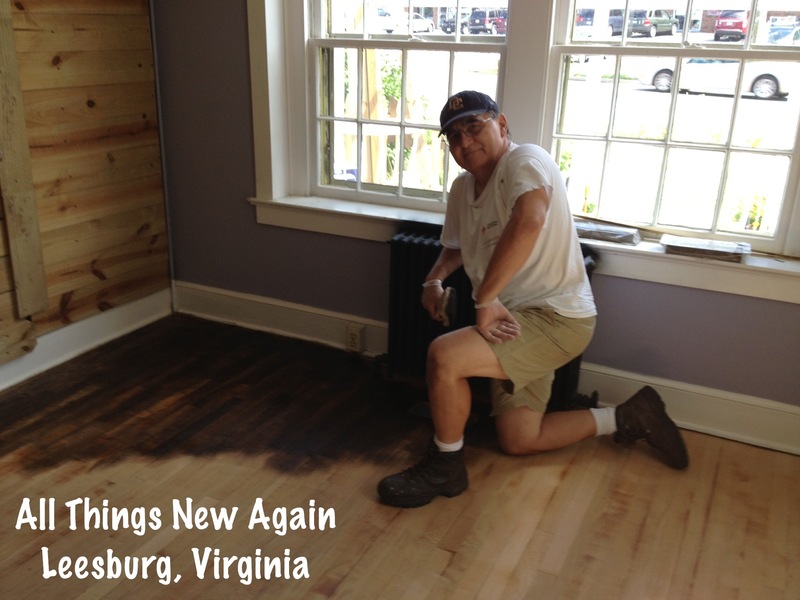 That’s one of the most frequent questions long-time Sawdust Specialties customers ask me when I tell them about our concept for our new shop, All Things New Again. I like the primitive style so much that we are devoting an entire room in the new shop to it. The front room of the store (where the “front porch” used to be) will feature primitive furniture and other home décor items. Notice I said where the front porch “used to be”? Dave constructed that front porch along the wall next to the kitchen. It was the focal point of the room for many years. But like so many other things in our little white house, it was time for a change! Demolishing the porch was the first step in the total renovation of this room. 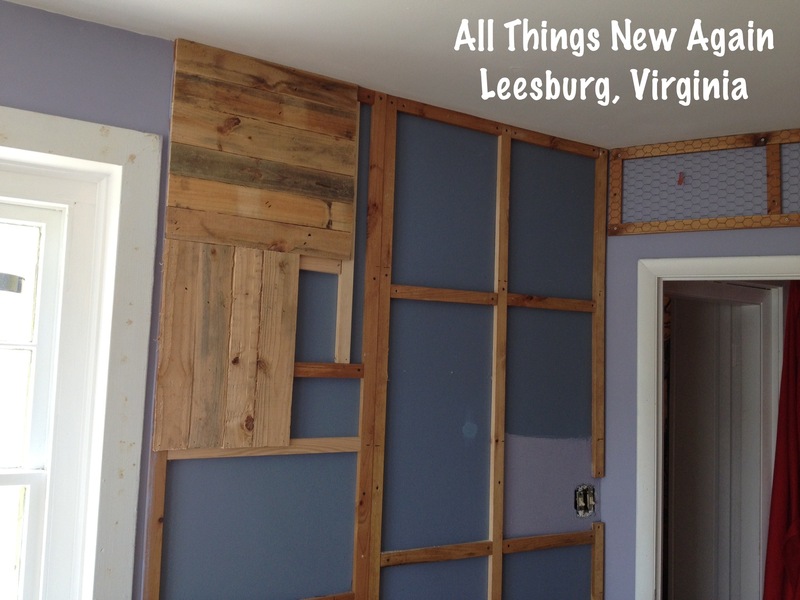 We left the wood in place on the wall and saved the rest for a future project. With the front porch structure gone, this opened up the room immensely. It looks huge now! There is a lot of room to showcase a lot more furniture than we could fit in here before. The next step was to paint the rest of the walls a rich, neutral gray color. The walls of this old house are built of solid plaster. They are sturdy, but it is incredibly difficult to hammer nails into them for hanging merchandise. Our solution was to take apart old wood pallets—lots and lots of pallets—and secure them to the wall in a fashionable basket-weave pattern. Now we have more flexibility for hanging items on the wall along with more interesting walls than just plain old gray everywhere. The updated walls made the carpeted floor look AWFUL! Many years ago, a lady who grew up in this house came into the shop. She told me about her mother’s beautiful hardwood floor. We tried looking for it when we did our kitchen renovation, but only found layers and layers of linoleum and glue. It proved so challenging to scrape away that we ended up installing new laminate flooring on top of it. Maybe we would have better luck in this room? 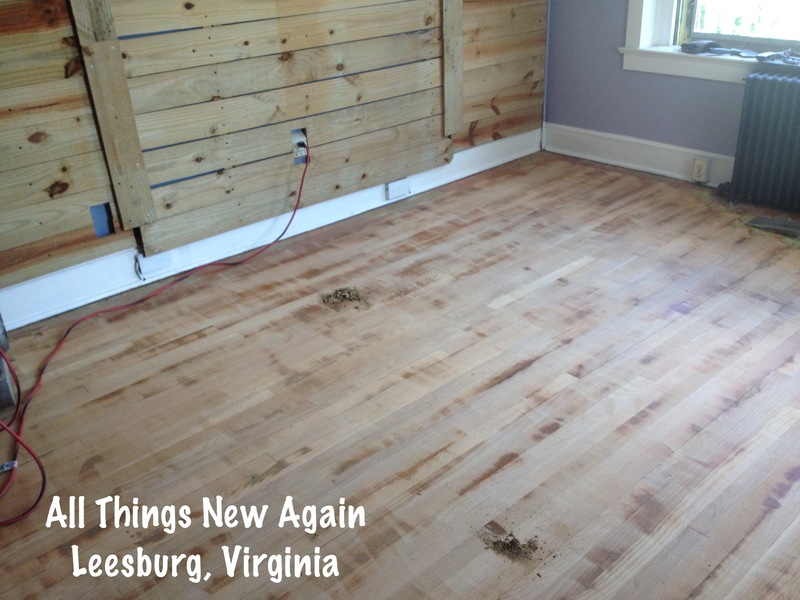 Dave started peeling away carpet and padding and there it was…the hardwood floor this lady remembered. It wasn’t exactly beautiful anymore, but with a little elbow grease and TLC, Dave was able to restore it to a fabulous finish. 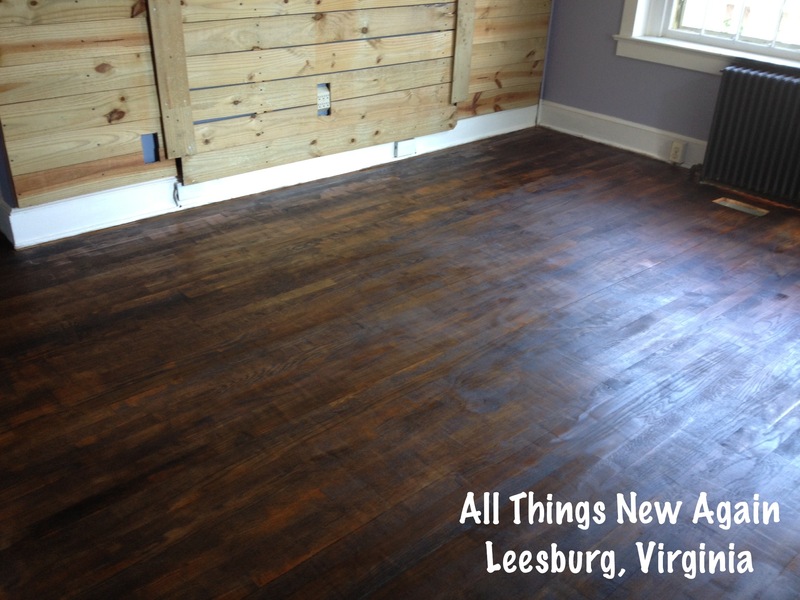 He rented a floor sander to strip it down to bare wood, then stained it a dark walnut and finished with a sealer. The floor has been transformed from the shabbiest part of this room to the chicest! Now it’s time for the fun part—loading up the room with great merchandise! 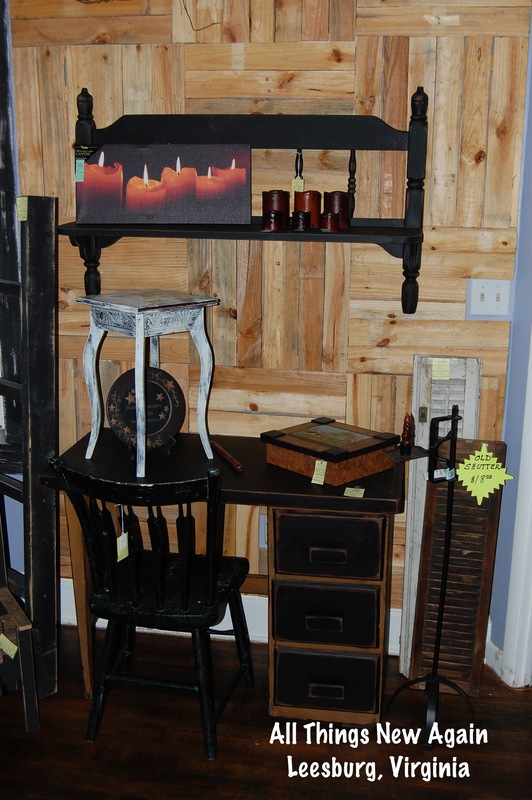 We have some really nice pieces of furniture in here right now. You just have to make your way through the rest of our construction to get to it. Sometimes I feel overwhelmed by how much work is left to do in the shop before we are ready for our grand opening. Then I walk into this room and see how much nicer everything looks against a clean, crisp backdrop and stunning hardwood floor. We still have a lot of work to do, but I know it will all be worth it!